A happier CHUM-Bolt takes time out to awkwardly dance to his favorite sound... screeching steel. CRO-Bolt contemplates the joy he has inadvertently brought to others. Movable Jaw - fully open or close it or tilt it for a snarl. Eye Plug - rotate it for upset or amused expressions. Claw Hands - for getting a grip. 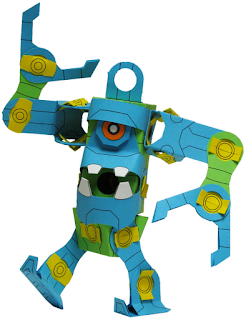 Extra Parts - build more crazy bots! Glue-on Details - perforated eyes and teeth for brighter smiles! When you buy a single CRO-Bolt pre-cut paper toy, it comes shipped to you in a regular envelope - the tri-fold creases overlap with the folding lines on the larger parts, so don't worry -- everything will look great! Ordering two or more OR ordering internationally will require a large 9"x12" envelope for shipping. SHARE your CRO-Bolt pictures with links in the comment section below. 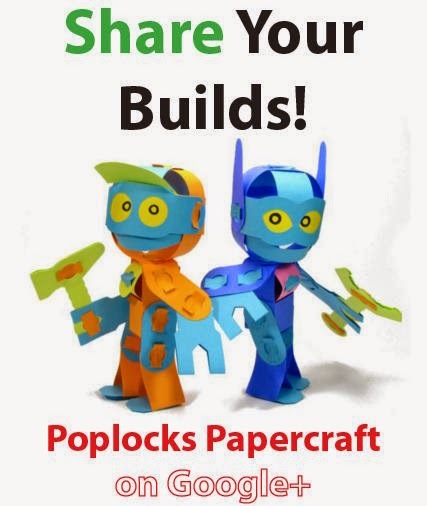 I'll help you show off your CRO-Bolt, CHUM-Bolt or anything else you can build with this kit!